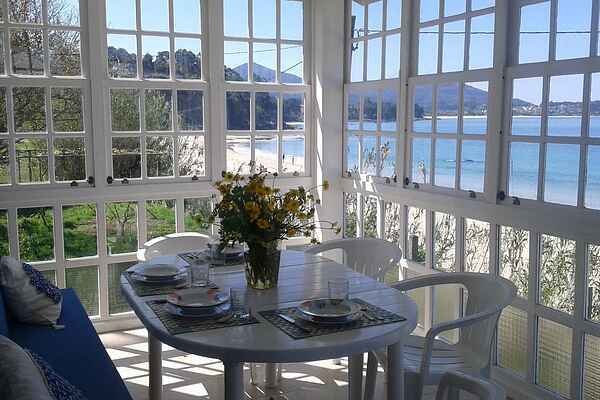 Miramar is a cozy house of wood and glass, located on the beach of Coira in Portosin. A beautiful wooden boardwalk connects the fishing village with the villa. The house has two double bedrooms and two bathrooms with shower. The kitchenette is equipped with all kitchen utensils. There is a spacious garden with barbecue and direct access to the beach. From the living room and the glass conservatory there is a superb view over the Atlantic Ocean and you can enjoy a spectacular sunset. The climate in this area is mild throughout the year and in the summer there are lots of bright days with pleasant tempertures. The region is perfect for sport fishing and water sports such as surfing and sailing. In a radius of 25 km you will find the natural Park of Corrubedo, Castro de Barona, the Sierra del Barbanza and medieval villages like Noia, Porto do Son and Pobra do Caramiñal. The airport of Santiago de Compostela is only an hour's drive. - Baby cot is provided free of charge upon request. Cot sheets are not available. - The house has a canoe that can be rented.